• Paper: Get creative! Use fun paper from the craft store, or design and print your own custom pages. • Padding Compound: Specially formulated padding glue comes in 3 varieties. • Padding Brush: Used to paint on the glue. • Clamp: Used to hold the pages together tightly for gluing. You can use several binder clips (enough to hold your stack tight), a table clamp, or even some heavy books. • Chipboard Backings (Optional): Create a more sturdy back to your pads with an optional chip board sheet. • Padding Knife (Optional): If making multiple pads at one time, use a padding knife to cut the glue and separate your pads. • Pad Counter (Optional): If making multiple pads at one time, use a pad counter to turn a large stack of pages into multiple smaller stacks with the same thickness. • Padding Press (Optional): If making pads in bulk, a padding press will allow for fast, high quantity padding. The directions will vary depending on the machine you use. Now that you have everything you need, here are some simple how-to instructions for making DIY notepads. ① Square your stack: Jog your pages into a square stack. If using chip board sheets, add one to the bottom of the stack. If making multiple pads at once, use the pad counter to turn your thick stack of sheets into several evenly-thick stacks and separate them with a chipboard backing. ② Clamp your stack: Use your clamp to hold the binding edge of your stack tight. ④ Remove your clamp: Once dry, release your clamps and you have your beautiful finished pads of paper! If you created multiple pads separated by chip board, use your pad knife to cut the glue under each board and reveal your notepads. 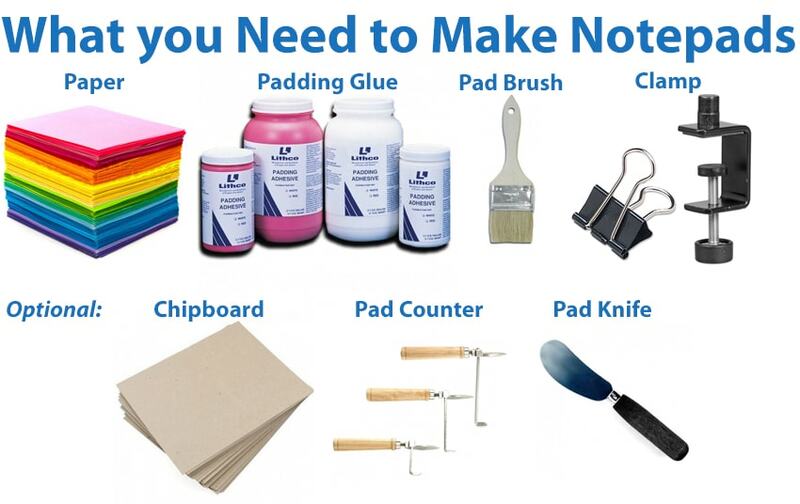 Have you made your own pads of paper? We would love to hear your tips and tricks! Send me an email to info@buy101.com and you could be featured in our next blog! Plus, check out my other notepad binding blogs, including how to make personalized notepads and 4 simple steps to make adorable hand-made pads of paper.